with a theme of "Art and Artists". All start at 7.30 pm with doors open from 7.00 pm. Eames - The Architect and The Painter. The husband-and-wife team of Charles and Ray Eames were America's most influential and important industrial designers. Admired for their creations and fascinating as individuals, they have risen to iconic status in American culture. 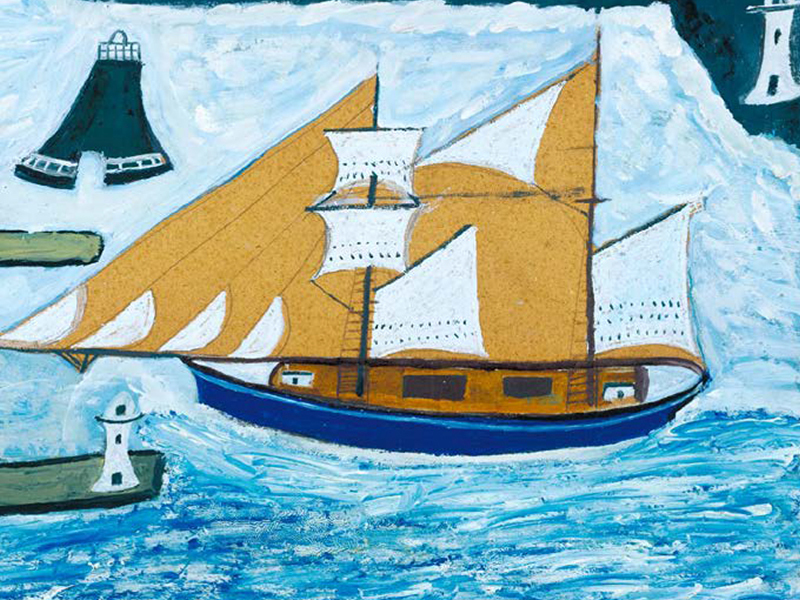 A dramatisation of the autobiographies of New Zealand author Janet Frame. The film follows Frame from when she grows up in a poor family, through her years in a mental institution, and into her writing years after her escape. Annie Leibovitz - Life Through A Lens. 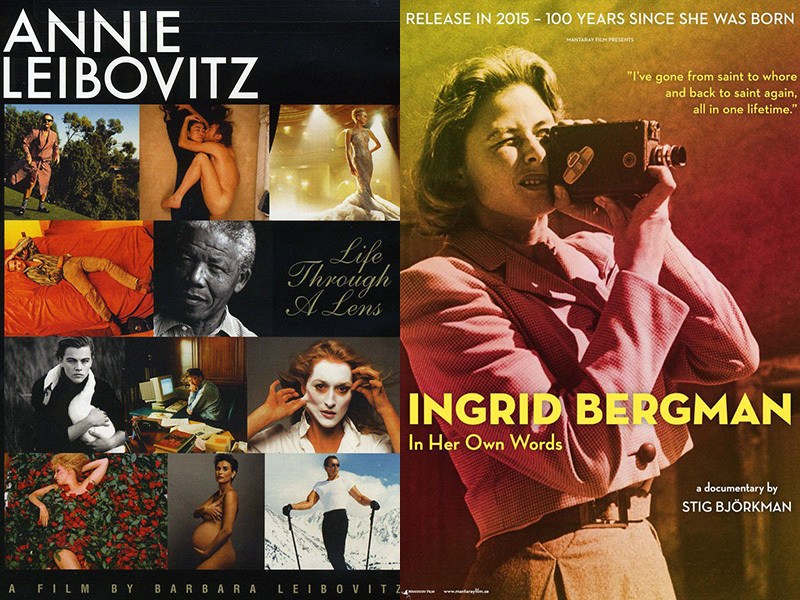 Traces the artistic self-realization of Annie Leibovitz, from childhood through the death of her beloved friend, Susan Sontag, and includes snippets of Leibovitz's last visual memories of Sontag. Basquiat tells the story of the meteoric rise of youthful artist Jean-Michel Basquiat. Starting out as a street artist, living in Thompkins Square Park in a cardboard box, Jean-Michel is "discovered" by Andy Warhol's art world and becomes a star. Ingrid Bergman - In Her Own Words. 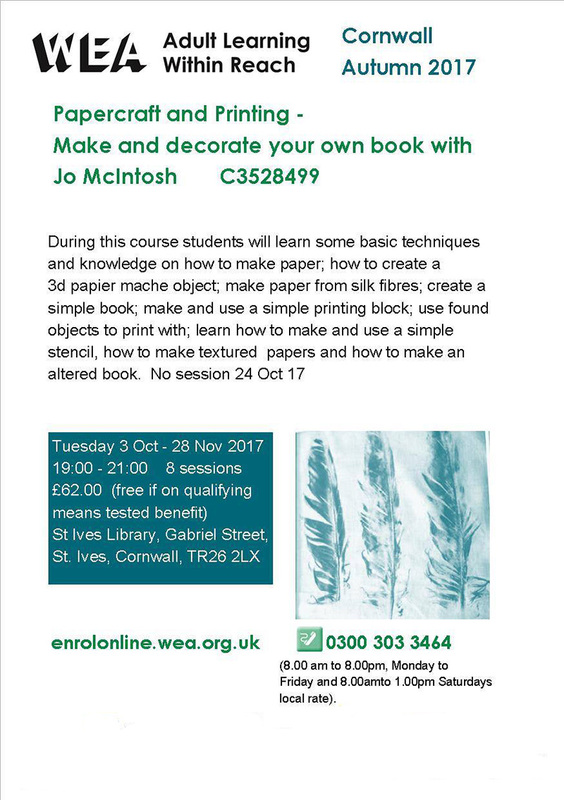 St Ives Library - two Creative Crafts Workshops with textile artist Jo McIntosh. 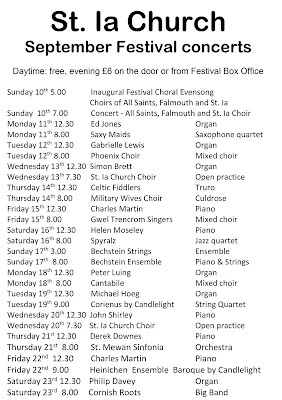 St Ives Parish Church - a programme of concerts. 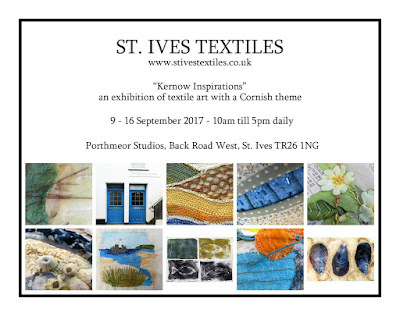 St Ives Textiles Group - an exhibition - Kernow Inspirations - at Porthmeor Studios. 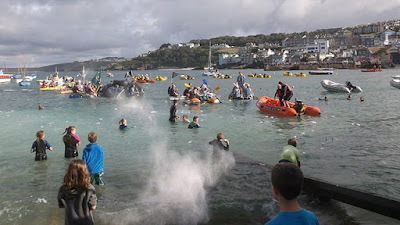 Thursday 17th August - 10.00 am to 4.00 pm. At the Lifeboat House on St Ives Harbour. Fun for all the family - and a fundraiser for a good cause. 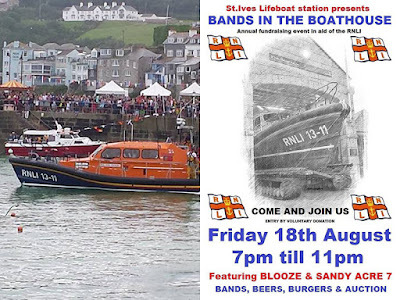 All proceeds go to St Ives RNLI. From 7.00 to 11.00 pm. Live music from Blooze and Sandy Acre 7. 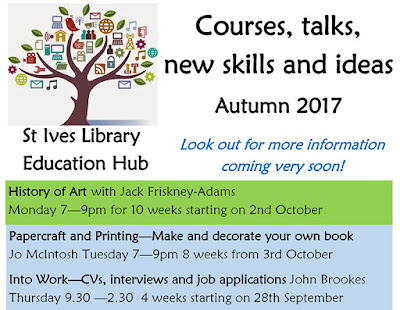 Starting at St Ives Library on Tuesday 3rd October 2017 - from 7.00 pm to 9.00 pm - a new 8 week course. 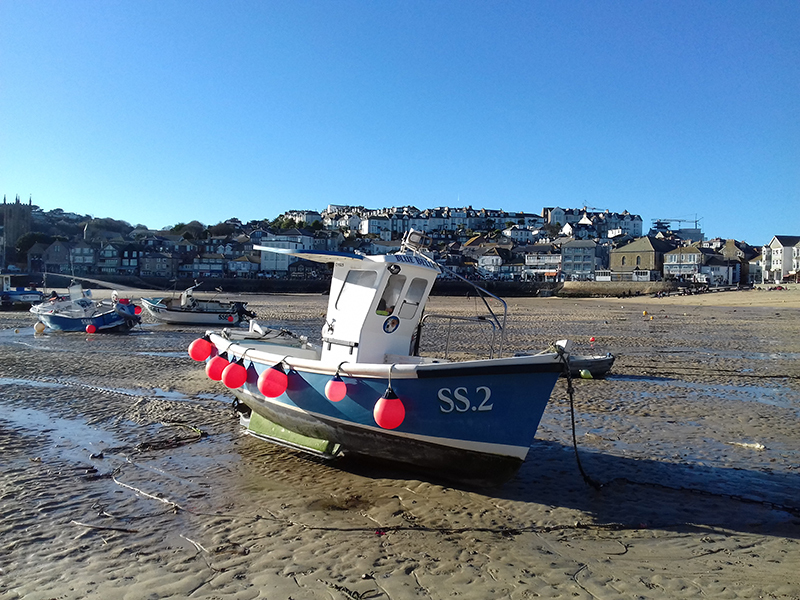 Running every Tuesday evening until 28th November. Learn how to make your own textured paper. Make paper from silk fibres. Create your own book. Make and use a simple printing block. Use found objects to print with. Design, make and use a stencil. Get creative, learn something new, have fun! Cost is £62.00 for the full 8 week course. Free places are available for those on low incomes. If you want to attend - you MUST book a place in advance - if there are not enough people interested it will not run. You cannot just turn up on the first evening. 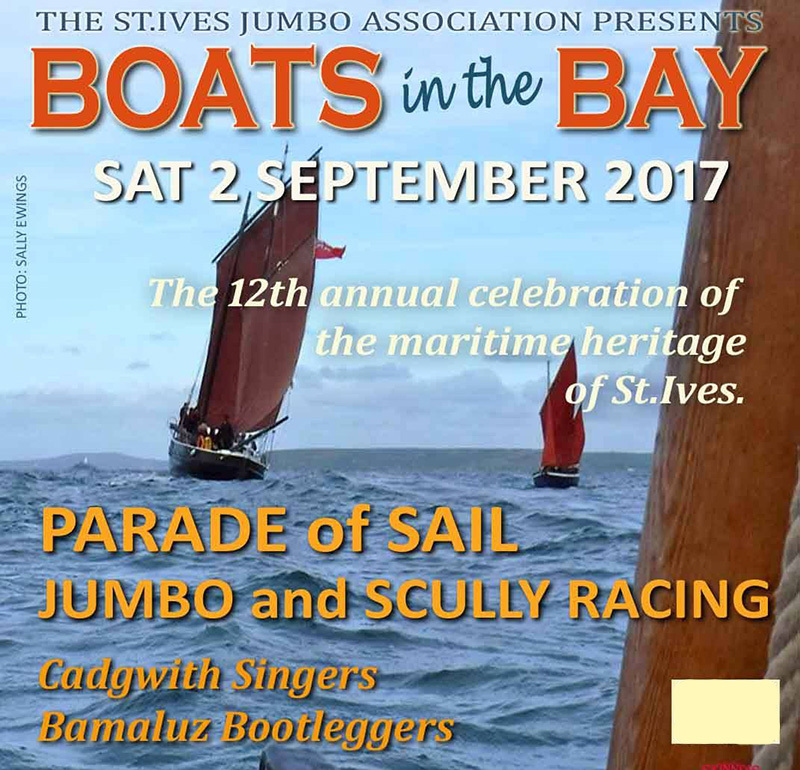 St Ives September Festival 2017 - and there is some good stuff. This includes live music, theatre, comedy, films and talks. Imago Theatre Company - a new production - Molly’s Terms. Cornish Women on the Verge - Jack and Jenny - the Musical!. Morgan and Rees - comedy sketch show. "The dysfunctional duo occupy the uneasy hinterland of our lives, spanning the spectrum between the psuedo-intellectual and the idiot savant ......"
Sweet 'N Sour - comedy improvisation group. 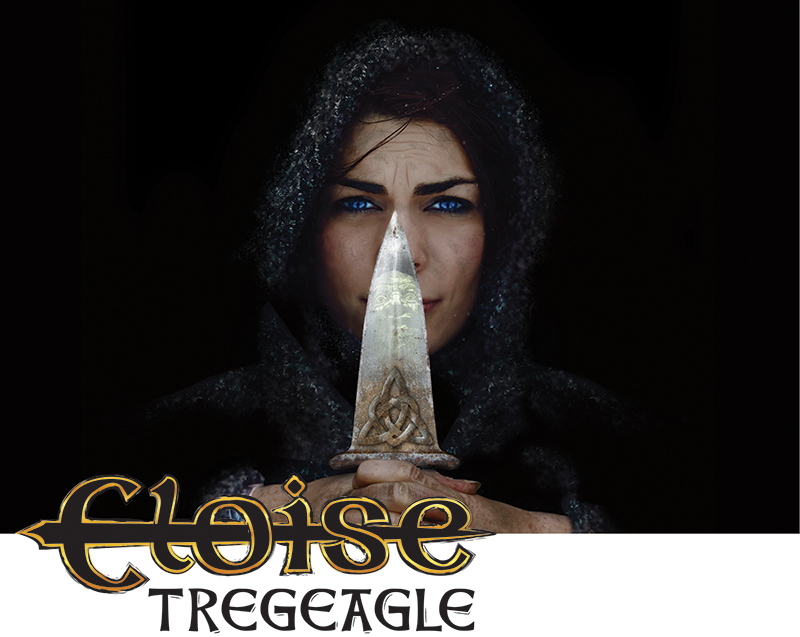 Tyn Daga - Eloise Tregeagle - a musical story. 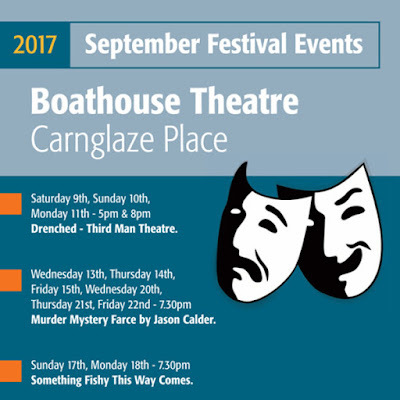 "An uplifting tale of love, loss and redemption ....."
Tickets are also available over the counter at St Ives Visitor Information Centre at The Guildhall. 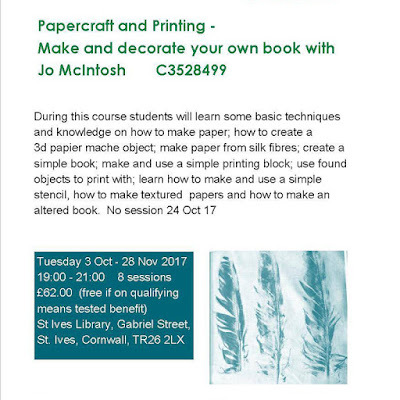 St Ives Library are hosting two Creative Crafts Workshops with textile artist Jo McIntosh. St Ives Parish Church are hosting live music every night. 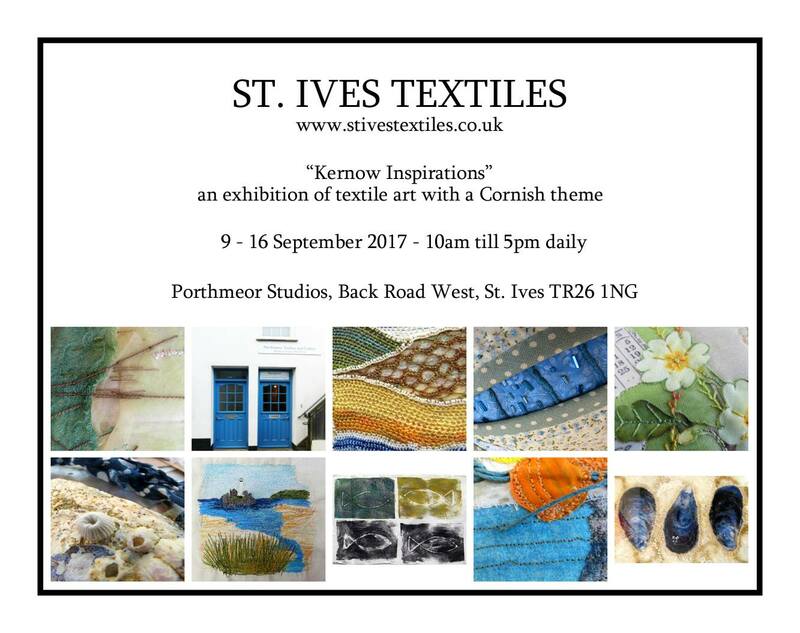 St Ives Textiles Group have an exhibition - Kernow Inspirations - at Porthmeor Studios. 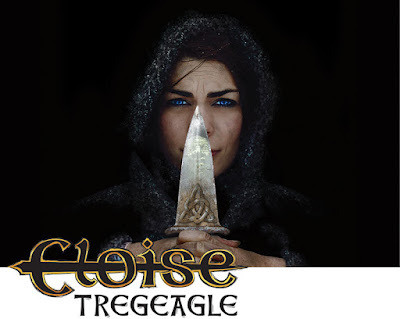 I welcome any comments and any ideas for future posts. 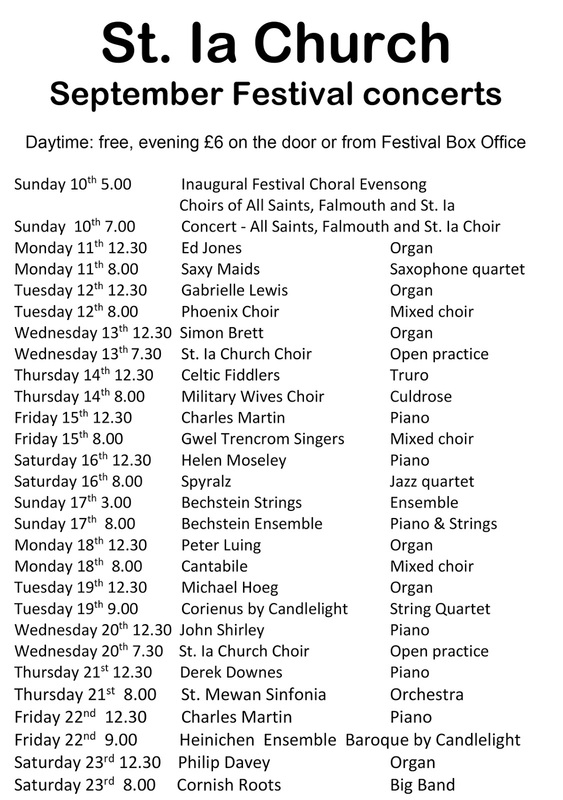 St Ives Parish Church is hosting an extensive and varied programme of concerts in September. 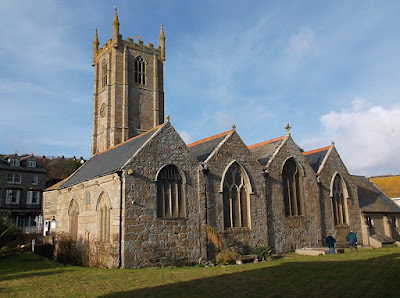 Music every lunchtime and evening in the atmospheric setting of our Mediaeval Church. Lunchtime concerts start at 12.30 pm - free entry - donations invited. 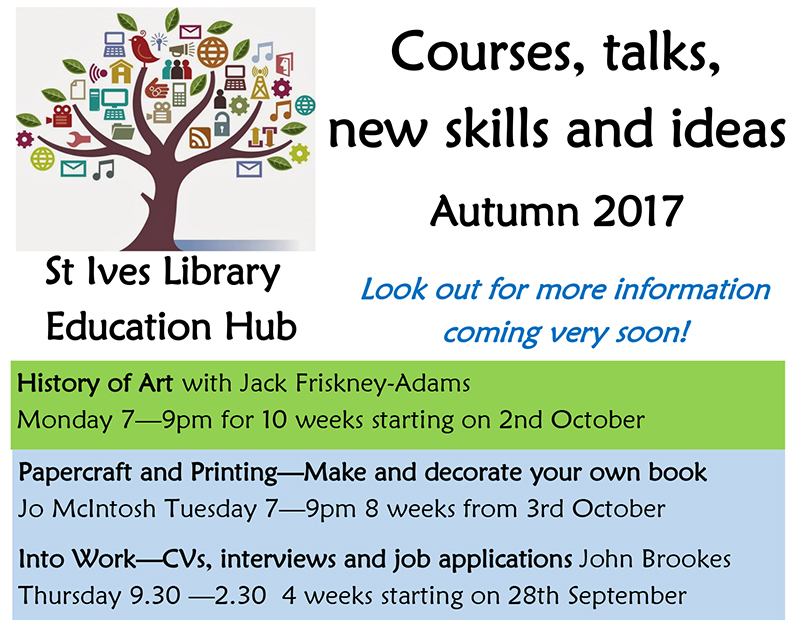 Plans are moving forward to establish an "Education Hub"
An initial programme of courses will be running from Autumn 2017. Into Work — CVs, interviews and job applications. Thursdays 9.30 am — 2.30 pm - 4 weeks starting on 28th September. 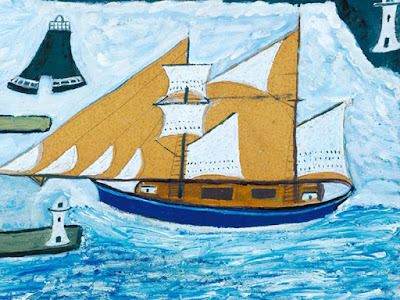 History of Art - with Jack Friskney-Adams. Mondays 7.00 — 9.00 pm - 10 weeks starting on 2nd October. Papercraft and Printing — make and decorate your own book. Tuesdays 7.00 —9.00 pm - 8 weeks starting on 3rd October. 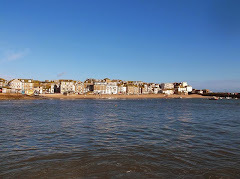 Workers Educational Association (WEA) Cornwall. help and free places are available for those who qualify. Further courses are scheduled - in association with Penwith College. Also a series of free taster sessions for 2018 courses. More details of these will be posted here soon.